Nations very rarely get an opportunity to develop and nurture an industry that grows at high double-digit rates for two decades; provides massive foreign exchange gains; generates direct employment at levels way above the per capita income; catalyses the creation of four times the jobs in other industries (Source: Nasscom Strategic Review, 2007); becomes the basis for development of new suburbs and cities; spurs migration of people from smaller towns in huge numbers; and, in short, lifts an entire economy. Today, the business process outsourcing (BPO) industry is all of this and more for India—it is our gold, our silicon, our oil. And instead of feeding and nurturing it, we are doing everything possible to strangle it. Over time, the stronger rupee, the likely discontinuation of export tax benefits, rising infrastructure costs and inadequate government investment in developing “employable" educated talent will take their toll. There is an acute need for active support to the BPO industry. Let us look at some basic facts on how the BPO industry is vital for India. It doesn’t take much to figure out the impact of the BPO industry on the Indian economy. Just take a walk or drive around in Gurgaon, Powai, Malad, or almost anywhere in Pune. A very large percentage of the new and glossy commercial real estate is occupied by BPO companies (45%, according to the latest real estate survey I have seen). Who lives in the new housing complexes around them? Employees of BPO companies. What about the BPO-driven consumer spending that has spurred growth in the auto industry? Who is shopping in the malls in those areas, taking mortgage loans, eating in local restaurants and buying new insurance policies in large numbers? BPO employees and their family members. Who employs round-the-clock security guards and facility management staff, many of whom come from rural areas? BPO companies. These firms are also handing out billions of dollars in contracts to telecom companies, legal firms, accountants, catering companies, and HR consultants. The “BPO economy" in India today is anywhere between $25 billion and $50 billion and growing 30-40% a year. 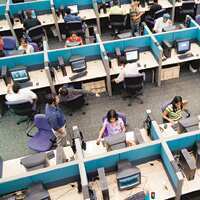 According to Nasscom estimates, it employs about 550,000 people, about the same as the IT industry now, but BPO employment is growing faster than IT and touches a much wider spectrum of society. A number of industries that benefit directly or indirectly from BPO, particularly real estate, are anticipating that the BPO industry will continue to grow at such a rate. India’s BPO companies today support large and world class infrastructure and diverse supplier communities in Mumbai, Pune, Gurgaon, Nashik, Bangalore and Coimbatore. Over the last five years if one also includes ex-employees, the top five BPO players would have influenced the livelihood of more than 400,000 families. Indian BPO players are ranked among the top global players in every single segment that they participate in. We invest massively in training, quality assurance, productivity improvement and information security. Our employees get free or subsidized food and transport. We work tirelessly to meet the demands of top global corporations day after day. We run award-winning corporate social responsibility programmes and actively support our communities. We are proud of what we do for our customers and what we achieve for our people and our communities. Yet, we get a feeling that we are not getting the nurturing and support we need. Something’s wrong here. Today, the economics of the Indian BPO industry are getting significantly challenged by changes in currency, rising people and infrastructure costs, and the potential removal of export tax benefits in 2009. The simplistic view is “You guys are big boys. You make enough money. Figure it out, and pay your dues." Some of that is true. But let’s look at the other side of the story. If an industry has nearly half its margins erode in just two years, then a few natural and obvious economic events occur. Smaller companies close down or get bought for peanuts. Big companies go to other countries where the economics are better or, at the minimum, allow BPO firms to hedge their bets. Today, China, the Philippines and even neighbouring Sri Lanka are offering long-term tax benefits to the BPO industry, and WNS, a leading BPO company, is listening. If the BPO industry growth has a catalytic effect on the rest of the economy, then there is a larger problem of a hit on a major part of the Indian economy. The BPO industry needs a stable or a gradually declining currency, more government support on education and, at the very least, a gradual phasing out of the export tax benefits. The special economic zones (SEZ) programme as designed today is insufficient to mitigate the impact of the ending of the 10A/10B tax benefits, and SEZs do not yet offer attractive options for smaller and mid-sized players. Strangulating it, through an almost overnight change in economics, will create opportunities for Jack (read: China or the Philippines) to steal the golden goose while the complacent giant sleeps.